A cap for warmth? A cap to sleep in? An undercap or should we call this a hood? The Philadelphia History Museum doesn’t date this cap, and nothing elsewhere is like it. I include it because it is unique, and doesn’t have any 19th C characteristics. It could be 18th C, or of course, much later. It’s a simple 2-piece cap made of very heavy linen. four pleats at the nape give it enough shape to snug one’s head. A 1″ hem along the straight front edges add heft. Plain linen tapes tie it under the chin. The edges are finished by wrapping a linen piece over the edge and sewing it down inside and out. The two main pieces are almost square, with just one corner rounded off, which becomes the shaped crown. These are joined with a felled seam. The original is stained and spotted, and one of the halves is pieced about 2″ up from the bottom edge. It was with a group of caps, hoods (oh, those silk hoods! 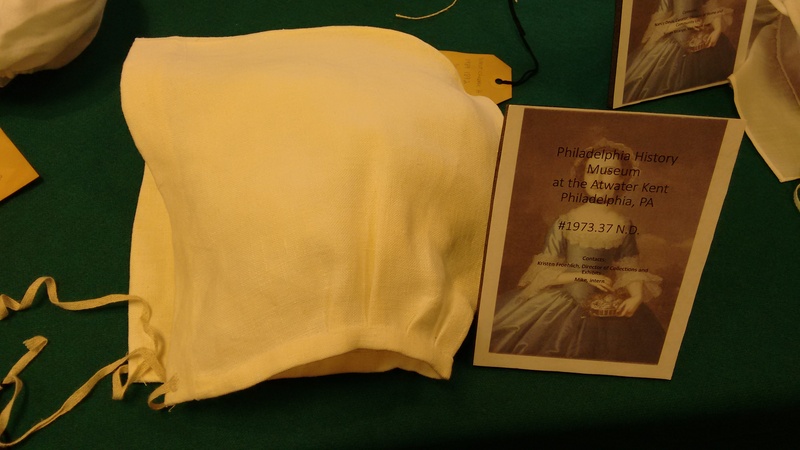 ), and bonnets, some of which have 18th C dates. 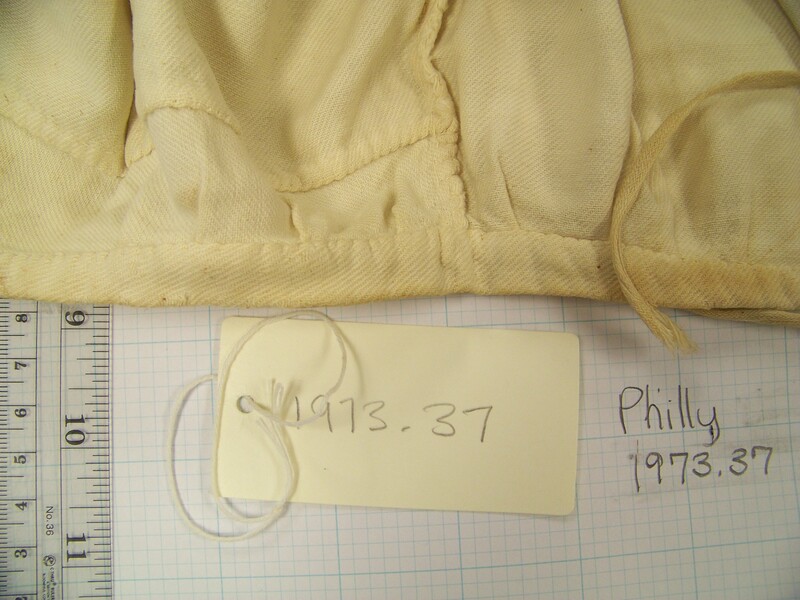 Detail of Philly 1973.37: the front edge has a wide hem. Inside detail.of Philly 1973.37 shows casing and piecing. You think you have measured and examined every possible angle of an item, and then a question arises that you still can’t answer. 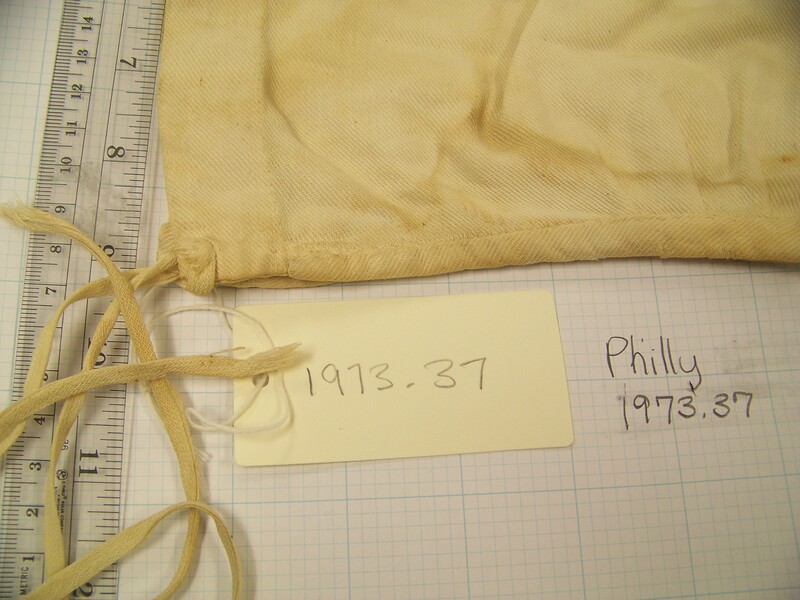 I couldn’t determine from my notes whether that string was a gather string that went through the bound bottom edge, or just a tape sewn on the outside. I decided it was a tape sewn on the outside. What do you think? I have not found any American portraits with a cap or hood like this. I’m still looking, of course. I’m reminded of the Chocolate Girl’s colored cap cover (French, 1743). Some baby caps fit snug to the head like this, made more commonly in three pieces than two. But this is an adult size cap for sure. It fits my head, and I have a big head. Boston MFA 37.457 Infant cap in 2 pieces, 18th C.
The Boston MFA, for example, has a 2-piece infant cap (dimensions 16.2 x 15.5 cm (6 3/8 x 6 1/8 in.). 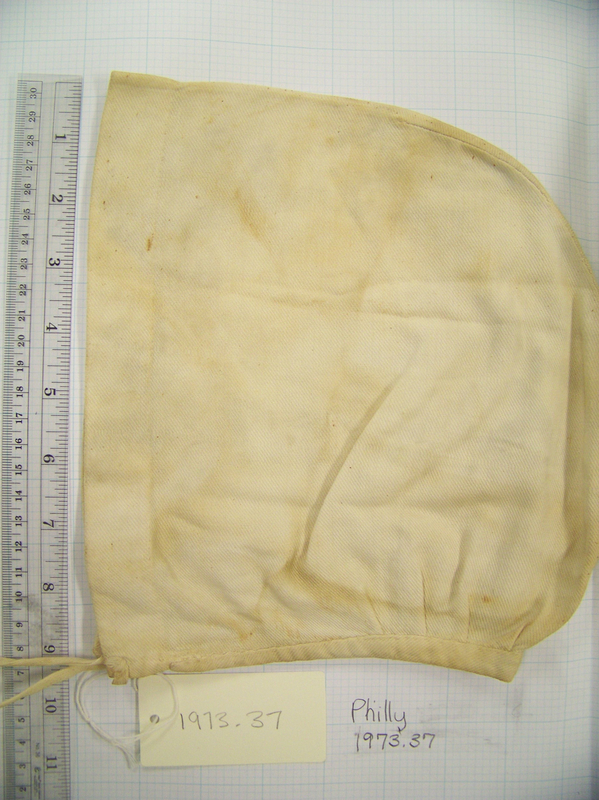 I made this cap of a heavy linen, very similar to the original’s thick slubby cloth. I had never had to figure out pleats from scratch before, so that was a challenge. four little pleats on each side was maybe a good introduction to the world of measured folds. I like this cap for its practical uses. it really is warm and stays on when sleeping. Field-tested HA headwear. My repro of Phill 1973.37. This is one time when I could closely replicate the cloth. I sort of patterned this while I looked at it, so the pattern and notes are one thing. I am not aware of any related scholarship for this cap. It does not have an online catalog record.